Russell Wilson has been under heavy pressure throughout the first four games. Russell Wilson is earning every penny of his new contract the hard way. 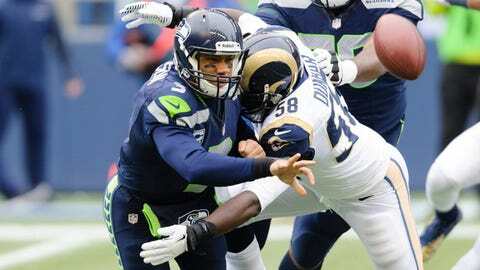 Although the season is only four games old, Wilson is on pace to challenge the NFL's single-season record for sacks by a quarterback, set by former No. 1 overall pick David Carr with the then-expansion Houston Texans in 2002. Wilson has already been dragged down 18 times – the second-highest total in the league behind Kansas City's Alex Smith. He was sacked six times for the second time in a game this season in Monday's 13-10 victory over the Detroit Lions. Indeed they do or Wilson will eclipse the franchise record for sacks (67) set in 1992. There is no respite on the horizon with Sunday's matchup against the Cincinnati Bengals, who sacked Smith five times last week. Cincinnati's Andy Dalton has been sacked just 2 times in 118 dropbacks. #Seahawks' Russell Wilson's been dumped 18 times in 145 pass calls.